September is recognized as Whole Grains Month and is a 30-day celebration for all things grainy. These whole grains are beneficial for heart health, overall health, and may even boost oral health too. 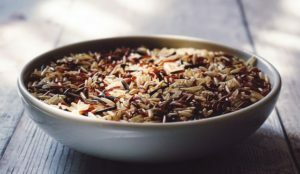 In this blog, our Asheville dental office covers some quick facts about whole grains and how it relates to good oral health, as well as some of the best ways you can help your family get enough of the good stuff. Whole grains are packed with vitamins, minerals, and fiber that are great for bodies of all ages. In terms of oral health, the B vitamins and iron found in whole grains help keep gums healthy, and the magnesium keeps bones and teeth strong. Research also shows that eating a good dose of whole grains can also reduce the risk of gum disease since whole grains help the body better process blood sugar. As we all know, sugar makes your dentist in Asheville shiver, and anything that helps protect the body against it is welcomed. Ensuring that your whole family is eating a well-balanced diet can go a long way in keep both bodies and smiles healthy. Getting regular dental checkups every six months can help too. If anyone in your family is in need of a dentist, call our dental office in Asheville to schedule an appointment today.